Can handle higher load capacities, and is resistant to most chemicals. 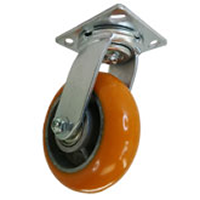 It is a non-marking material and its durability is unmatched by any rubber tread wheels. Can be used on almost all surfaces. Temp -40° to +180°.